The Credit Union of Georgia, with assets over $274 million, wanted to increase their auto loan volume in April of 2017. They set in motion planning a weekend car sale with special auto loan rates that would last throughout the month. As the plans came together, they contacted JB Communications Group to create the messaging and design to promote this special. Their great rate needed to be the focus to draw in local people, both members and non-members. The car sale’s dates and location being a close second in terms of visual priority. 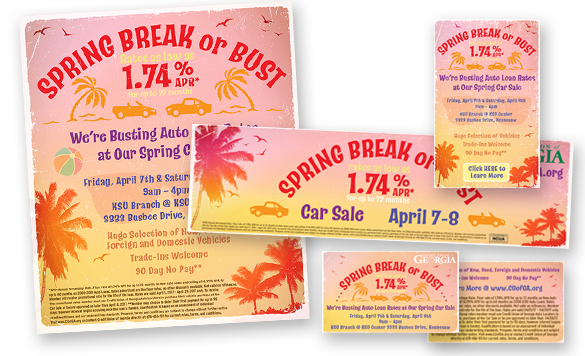 The Credit Union of Georgia also requested the art have a beachy, spring break feel as the local schools would be wrapping up their spring break. The design would also need to fit in well with The Credit Union of Georgia’s existing marketing style and be very versatile so it could work in many sizes, formats and uses. Their existing style is made to appeal to females from 30-50 years old. They use an illustrative style as opposed to photography to help their advertising stand out from other financial institutions. JB Communications Group took the requirements, the The Credit Union of Georgia’s overarching design style and created several initial advertisement designs. Their Vice President of Marketing and Business Development selected one of those designs, made some adjustments, and we were off! The chosen design is appealing to females 30-50, puts their great rate front and center, and promotes the dates and location of the car sale. The design was also proven to work in many formats and sizes as JB Communications Group created more than 15 different variations of the initial design. These variations were used in print and digital applications. With so much information to promote, some sizes and formats needed quite a bit of copy editing. We worked with the client to refine the message as much as possible, making that message as memorable as possible. The car sale generated above average loan close rates and more loan amounts than in recent car sales. JB Communications Group is proud to be some small part of this successful promotion!